Point Pleasant junior Allison Henderson (10) attempts a shot against several Poca defenders during the first half of the Lady Knight’s 57-36 loss on Tuesday night in Mason County, W.Va.
POINT PLEASANT, W.Va. — The visitors hit a plethora of trifectas in the opening minutes, setting the tone for another unfavorable result for the Lady Knights. 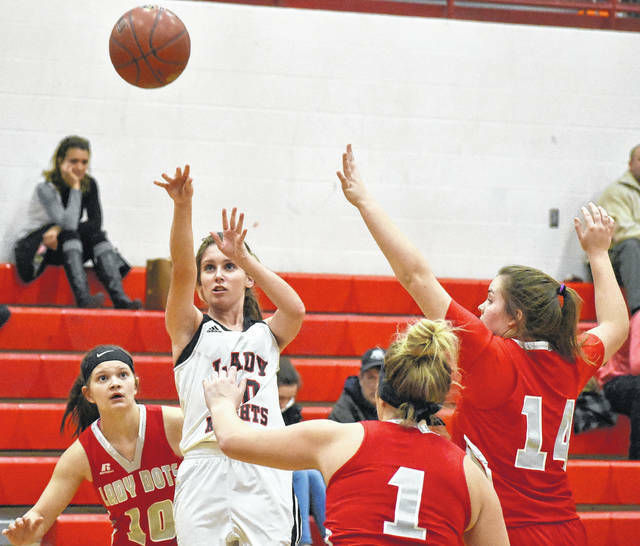 The Poca girls basketball team hit seven three-point field goals in the first period against non-conference host Point Pleasant on Tuesday night en route to a 57-36 win. PPHS (1-14) was held without a field goal until Peyton Campbell’s three-pointer with 36 seconds remaining in the first quarter ended a 22-0 run by the visitors. As a result, the Lady Dots (8-10) closed out the game’s initial eight minutes with a 25-3 advantage. The Red and Black made 1-of-10 field goal attempts and committed 13 turnovers in the first period. PHS countered with a 8-of-15 performance from the field, including 7-of-9 from three-point range for 78 percent. 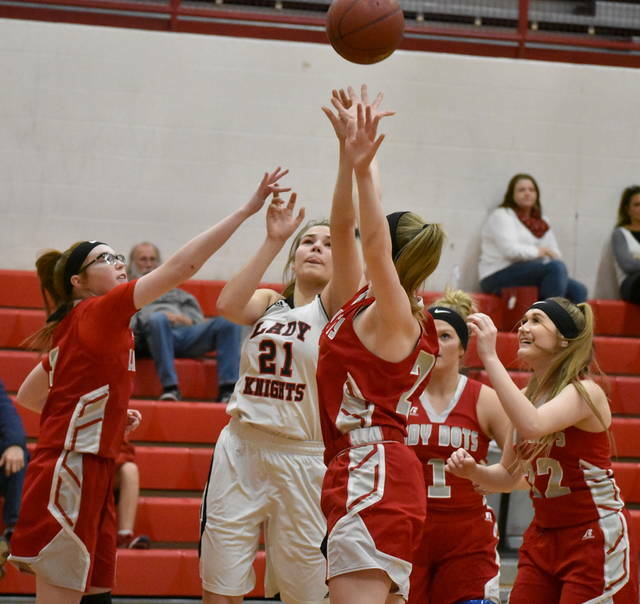 The Lady Knights scored five points in the second quarter, as the Lady Dots held a 24-point advantage by intermission. Poca entered the locker room with a 32-8 lead having held the hosts to just three field goals. In the third period, both teams improved their offensive production, but Point Pleasant trailed by a 26-point deficit entering the fourth frame. The Lady Knights shot 6-of-14 for 43 percent from the field, including 2-of-4 for 50 percent from three-point range in the third quarter. 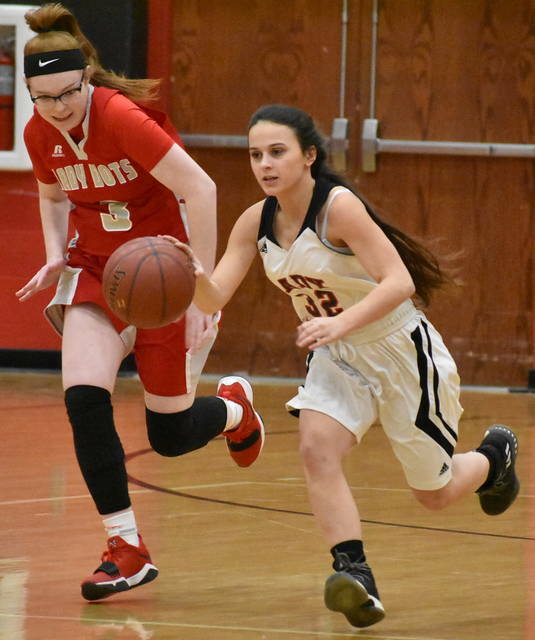 PPHS junior Peyton Campbell scored 10 of her game-high 20 points in the third frame, but the Lady Dots 18-16 run over that same span provided them with a 50-24 advantage. Poca closed out the final eight minutes of the contest on a 12-7 run to wrap up a 19-point outcome. Point Pleasant converted on 12-of-53 field goal attempts for 23 percent, including 5-of-26 from beyond the arc for 19 percent. The Lady Knights were also 7-of-13 from the free throw line for 54 percent. Two players reached double figures for the Red and Black, as Campbell provided 20 markers, including three trifectas, and Hannah Smith scored 10 points. Allison Henderson rounded out the scoring for the hosts as she chipped in six points. The Lady Dots made 18-of-47 shots from the field for 38 percent, including 9-of-20 from three-point range for 45 percent. The Red and White were nearly perfect from the charity stripe, as they made 12-of-13 shot attempts for 92 percent. Aubrey Chandler led the way with 19 points, including five trifectas. Taylor Bonnett was next with 12 markers, including a 6-of-7 effort from the free throw line. Molly Collins followed with seven markers, including one three-pointer, while Madison Ord scored six points. Devin Ord and Jessica Pontier had five points each, while Autumn Smith rounded out the scoring with three markers. The Lady Knights are back in action on Thursday versus Winfield.